GrabOne’s All Stars event brings you all the best brands, and only the best deals. And as if that wasn’t reason enough to live a little, if you buy any All Stars deal before 5pm on Tuesday September 20th, Wednesday September 21st or Thursday September 22nd, you’ll go into the live draw on The Hits for one of three new iPhone 7’s! 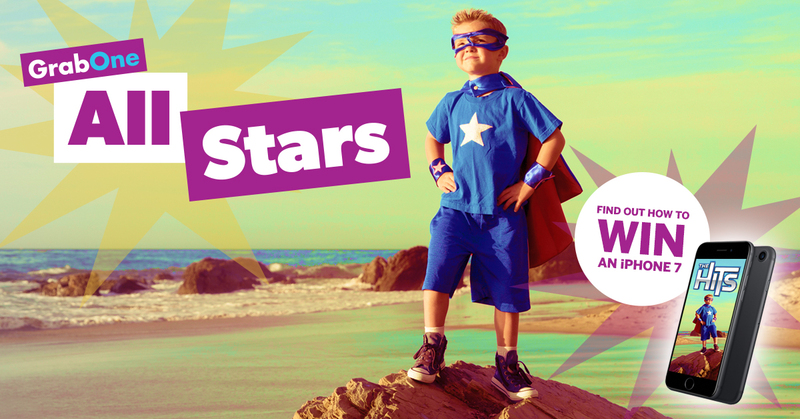 Simply buy any deal with an All Stars badge between midnight and 5pm on those days, and tune into The Hits between 5pm-6pm for the announcement of the winner! Enter by purchasing any deal labelled as all ‘All Star’ deal, with the All Star badge appearing on the image gallery. Purchases of All Star deals must be made between midnight and 5.00pm NZ time for the draw that day. Purchases made before midnight on Tuesday September 20th, or after 5.00pm on Thursday September 22nd will not be considered for any draw. There are three 32gb iPhone 7’s to be won. One on Tuesday September 20th 2016, one on Wednesday September 21st 2016, and one on Thursday September 22nd 2016. Multiple purchases of All Star deals are allowed and will count as separate entries for the respective draw. The draw will be made at 5pm on each day and the winner will be notified by phone by 6pm on the same day.The prize will be shipped to the address provided by the winner within 6 weeks of the draw being made. GrabOne cannot be held responsible for any loss or damage that may occur in shipping. No parts of the prize package may be substituted, transferred or on-sold.